Some thoughts from one of our diners here. My gf (Ms. Nora? 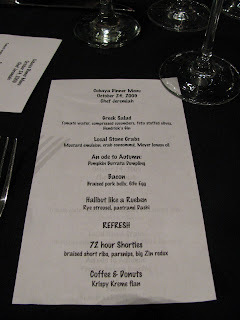 )and I had the pleasure of attending Dinner 2.5. I have no pictures, and even the ones posted fail to capture how special this place was right around sunset, with the panoramic bay views on one side and planes taking off framed by the setting sun. Thanks to our hosts again...the location framed some great food. And the food. Unlike some of the more overwrought dishes and flavors I find when a chef tries too hard to blow our minds, it seems Chef J. Bullfrog used complicated or innovative techniques while at the same time preserving the dishes' purity, freshness and lightness. No mean feat considering what, based on the menu, appeared to be a pretty "heavy" collection of dishes. Frod gives an excellent recap, I just provide my comments on the dishes to give another perspective. Even where I offer some criticism, it is in the context of someone who would gladly have paid for the privilege of taking home the garbage bags from this dinner...I consider myself wildly lucky to have actually eaten the food on plates and with such a fun group of foodies. The Greek salad 'martini' was innovative in technique (sous vide-ing the gin flavor into the cuke cubes), stunning in presentation and texture (who doesn't like a little tomato gelee in your tomato-gin water) and pure in flavor (I tasted the gin, but the overwhelming taste was a perfect bite of...tomato cucumber salad). Perfect salinity in the broth, working in harmony with the feta-stuffed olives. Stone crab on a big spoon with mustard sauce and lemon oil and a couple granules of brown sea salt. Would it be just as good if it wasn't on a spoon? Yep, just messier. Clean mustard-lemon flavor that highligted but didn't overpower the delicate stone crab taste. You can tell with this dish that regardless of the technique, texture, or presentation, flavor comes first for Chef Jeremiah. The pasta dish was the only one that missed the mark for me. The chef explained (warned?) that the gnocchi were heartier, I found them too much like small German/Austrian "knoedel" one usually finds sitting shotgun to an oversized piece of pork (luckilly, the pork came later and with much more savory sidecars). Here, as gnocchi, they could not carry the load as I tasted dense dough and no real flavor. The ribmeat I assume was left over from the 72-hour ribs from the night before, not sure that sous-vide technique added much. Seems like a lot of time and fussiness for beef that was good but not out of the park. But this was arguably Ms. Nora's fave dish, she loved the toothsomeness of the gnocchi (although it was a little heavy even for her) and the rich broth. 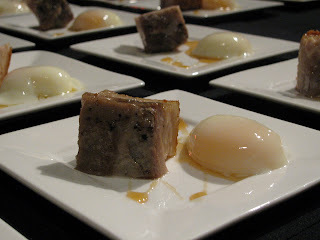 Pork belly and egg with maple syrup drip-- Perfection on a plate. The 63c egg was amazingly amorphous (was it solid, liquid, or some plasma-like state of matter) and somehow this made it even better tasting when sopping up little pieces of pork belly glazed in syrup. For all the times I have had pork belly, this simple, direct "breakfast" approach highlights what I like about Chef Jeremiah's style-- bold, perfect execution that is playful without being pretentious. I still don't get the halibut reuben. I mean, the taste was great, the broth mixed with the pretzel bits and pumpernickel seasoning really tasted like the drippings from a good pastrami reuben, and the fish was cooked to some ungodly perfect temperature and texture. It wasn't flaky, it "peeled" but it was perfectly moist-- it neither fell apart nor was it stringy. Once again, a mindblowing forum for an otherwise-traditional flavor (mixed with perfect execution). The suckling pig was Hialeah heaven. Perfect spices, no tricks, no modernity, just great butchering and a perfectly cooked lechon. The trotter cake was the signature to this dish, and it stood out even surrounded by perfection in pork form. The gelatin from the cheek combined with the porkiness of the trotters made for a "cake" that was really the pig version of foie gras mousse. I loved the bite I got where a piece of "cake" melted between the meat and the crispy piece of skin. My heart stopped a little, and I don't think it was the cholesterol spike. Desert was well done, the combination of flavors and textures reminded me of an aerated dulce de leche foam we just had last week at Cabanas Las Lilas in Buenos Aires...combined with the guilty pleasure of sitting and powering through a few Krispy Kremes. Not a bad combo. Chef Jeremiah provided a true show for us. Now I just need to release a few gold records and find a personal chef (Unless you want to share, Mr. Ross! ).